The Green New Deal has surged into the American political discourse over the last two months on a wave of activism and high-profile Democratic endorsements. According to its leading proponents at the activist group Sunrise Movement, the plan aims to “transform our economy and society at the scale needed to stop the climate crisis.” It seeks to decarbonize the economy, create millions of green jobs, and rectify racial and economic inequality, though a specific policy agenda has yet to be worked out. The Green New Deal, whose backers include Rep. Alexandria Ocasio-Cortez (D-NY), has polled very favorably with registered voters -- even though most Americans have heard nothing about it. The Sunrise Movement intends to spend 2019 building momentum and support for the plan so that it becomes a top issue for the 2020 presidential election. From there, the goal is to enact sweeping climate legislation in 2021. Despite the fact that this plan is not yet fully defined and has no chance of passing through Congress for at least two years, right-wing media have wasted no time in attacking it. Outlets from Fox News to Breitbart News to the Las Vegas Review-Journal have spread inaccurate claims about the Green New Deal to stoke fears that it would destroy the U.S. economy and political system. The Heartland Institute, a right-wing think tank known for its climate denial, is one of the most active opponents of the Green New Deal, and it is using right-wing media outlets to amplify its attacks. Here are some of the bogus arguments being employed by right-wing groups and media outlets as they attempt to discredit the plan. The Heartland Institute's main argument against the Green New Deal is that it's socialism in disguise. It recently launched a website, StoppingSocialism.com, that criticizes the Green New Deal as “energy socialism.” Justin Haskins, an executive editor and research fellow for Heartland and author of the book Socialism Is Evil, is the group's main spokesperson for its claim that the Green New Deal has a hidden socialist agenda. He has made two appearances on Fox News in January and written several op-eds for conservative outlets to push that line of attack. Many supporters of the Green New Deal know it will do absolutely nothing to reduce global temperature or prevent future temperature rise—the primary purpose of the proposal, according to Ocasio-Cortez. The real goal of the Green New Deal is to impose a series of radical, socialistic programs—policies that would dramatically increase the size and power of the federal government, cause immense harm to the U.S. economy, and run up the national debt by trillions of dollars. Heartland’s attacks on the Green New Deal should come as no surprise -- the organization has a long history of promoting climate denialism, and it has received funding from both Koch-backed groups and fossil fuel companies. None of its fossil fuel funding was disclosed in any of Haskins’ recent Fox appearances or op-eds attacking the Green New Deal. Some conservatives have been criticized for arguing that fears of global warming are being intentionally exaggerated by those seeking to use the issue to advance collectivism and radical socialism. Rep. Ocasio-Cortez’s “Green New Deal” doesn’t even try to hide it. Several right-wing attacks on the Green New Deal have invoked the horrors of authoritarianism and warned that the plan would destroy the liberties that Americans currently enjoy. On January 4, Jarrett Stepman of The Daily Signal wrote that the plan “would upend our way of life and destroy the liberty and prosperity” that we enjoy. Some right-wing commentators have minimized the seriousness of climate change or resorted to climate denial when attacking the Green New Deal. Several of the opinion pieces that the Heartland Institute’s Haskins has written about the Green New Deal don't even mention climate change at all, including two he wrote for Fox News and one for the Washington Examiner. 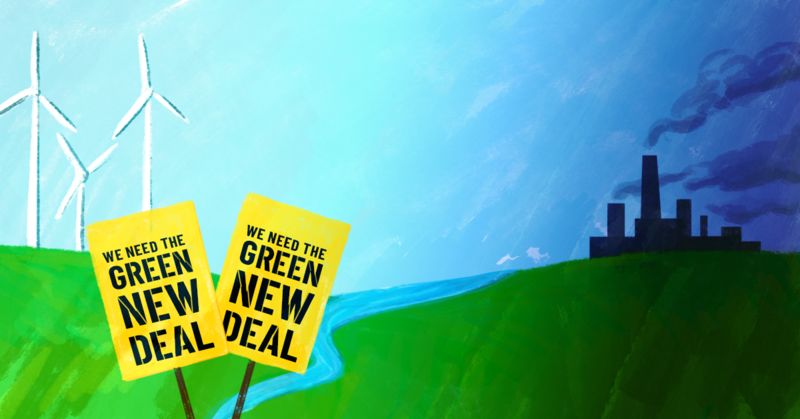 The Green New Deal is the most ambitious climate-action plan ever to get mainstream attention, and it directly challenges the power structures of right-wing groups and their backers in the fossil fuel industry. Even though it's just a broad outline at this point with no prospects for being enacted anytime soon, it's making conservative commentators very nervous -- so much so that they can't stop chattering about it. The right-wing media’s general obsession with Ocasio-Cortez also feeds their compulsion to cover the Green New Deal. Right-wing outlets appear to be giving the plan more attention than their mainstream media counterparts. A recent Public Citizen analysis found that Fox News made more mentions of the Green New Deal in November and December than other cable or broadcast networks -- even as half of the top 50 newspapers in the U.S. failed to mention the plan at all during the same time period. Fox's fixation has only intensified since the start of the new year. As we head into the 2020 election cycle and see some Democratic presidential contenders embrace the ideas behind the Green New Deal, we can expect right-wing media attacks on it to continue -- and to become even more absurd and overblown.